Daffodils are Blooming . . .
Daffodils have been blooming in Kerry Stone‘s studio! 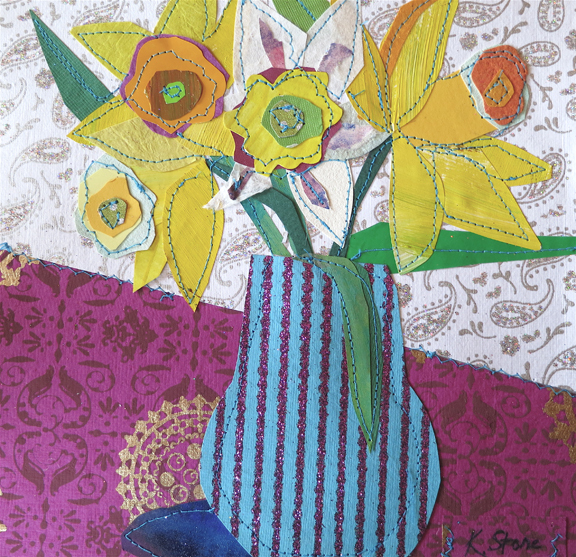 Kerry’s vibrant sewn paper collages celebrate the arrival of spring.The collages of daffodils and tulips are made from recycled and hand painted papers as well as colorful papers from India. The collage class will be playing with color, texture, rhythm and composition to make unique cards, collages and simple books. We’ll make textured papers, use recycled papers and enjoy some specialty papers from around the world for our creations.